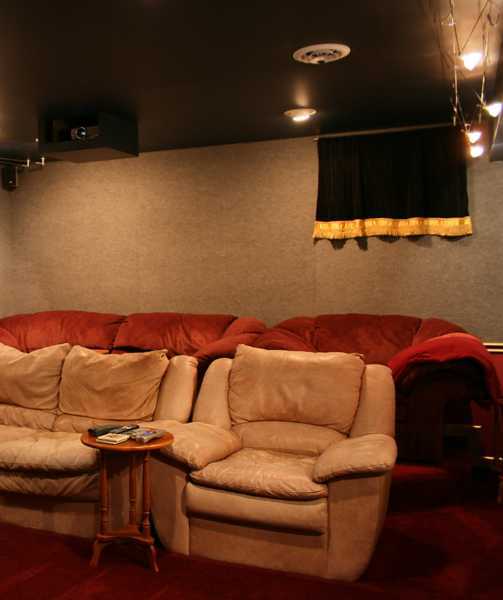 A home theater or a family room with a large screen is a great addition to your house design. This modern home interior, equipped with high-tech gadgets and a home entertainment center with surround sound, provides a comfortable place to enjoy time with your family and just relaxing and watching movies and shows. 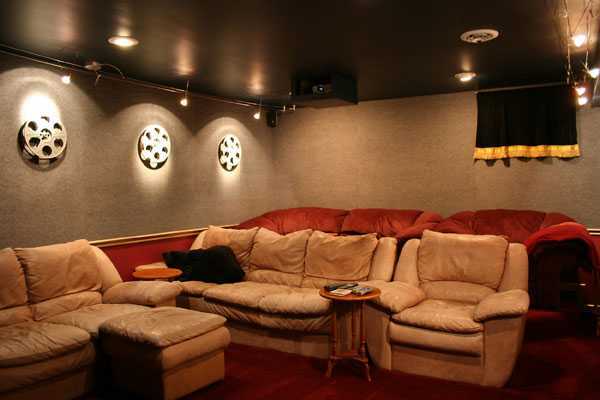 A modern home theater or a media room encourages families to spend time together. 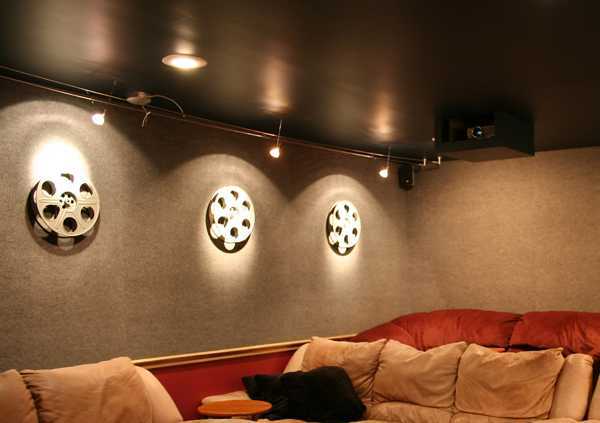 Movie-themed wall art, such as used film reel wheels and framed movie posters, a popcorn machine in a corner are wonderful home theater interior decorating ideas. Certain decorative elements add life to such rooms as well as improve the movie-watching experience, creating interesting, comfortable and welcoming interior decorating design. Dark painting ideas and dark floor carpet are excellent home theater or media room interior decorating ideas. Dark purple colors, black, deep blue and green colors, dark red, gray and brown colors add coziness to modern interior decorating and best movie viewing environment. Dark room colors help get a realistic movie-theater experience. If the home theater or media room is in a shared space of a family room, then light painting ideas or paint colors that match your family room furnishings colors help coordinate the home theater zone with the adjoining space and harmonize interior decorating ideas. Movie-themed interior decorating ideas may include stencil wall designs and old posters, pictures of your favorite actors and characters, a motion picture camera, a take clapper or reels of films. 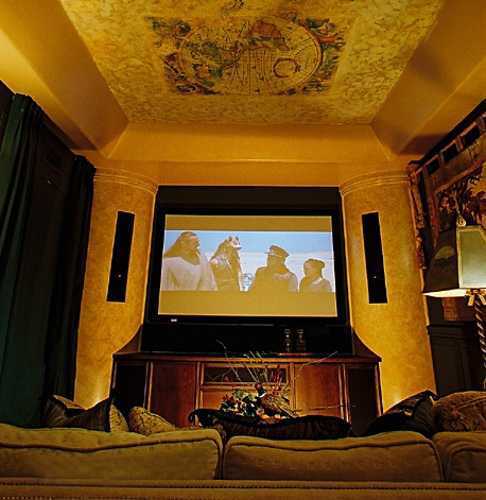 Wall sconces and ceiling lights with dimmers and a remote control for easy adjustments from your seat are great interior decorating ideas that add to realistic home theater feel. Rope lights along the bottom edges of the sofa or chairs increase the effect. Thick wall-to-wall carpet flooring with an under-layer for total sound insulation is the best for the sound quality. Dark blinds, that block out natural light if you have windows in your room, or heavy draperies in dark colors, deep purple color shades, black, deep blue and green colors, dark red, gray and brown colors with golden details add drama of a theater to your home theater interior decorating ideas. Choose large and accommodating home theater furniture that perfectly fit your space. Sofa recliners with cup holders that can seat four to six people or individual reclining chairs are ideal for home theater interior decorating. If you have a large room, add another row of chairs, include risers throughout the room to elevate these seats behind others.